The Transformer is said to be in Parallel Operation when their primary windings are connected to a common voltage supply, and the secondary windings are connected to a common load. The connection diagram of the parallel operation of a transformer is shown in the figure below. The parallel operation of a transformer has some advantages likes it increases the efficiency of the system, makes the system more flexible and reliable. But it increases the short-circuit current of the transformers. It is impractical and uneconomical to have a single large transformer for heavy and large loads. Hence, it will be a wise decision to connect a number of transformers in parallel. In substations, the total load required may be supplied by an appropriate number of the transformer of standard size. As a result, this reduces the spare capacity of the substation. If the transformers are connected in parallel, so there will be scope in future, for expansion of a substation to supply a load beyond the capacity of the transformer already installed. If there will be any breakdown of a transformer in a system of transformers connected in parallel, there will be no interruption of power supply, for essential services. If any of the transformer from the system is taken out of service for its maintenance and inspection, the continuity of the supply will not get disturbed. For the satisfactory parallel operation of the transformer, the two main conditions are necessary. One is that the Polarities of the transformers must be same. Another condition is that the Turn Ratio of the transformer should be equal. The voltage at full load across the transformer internal impedance should be equal. 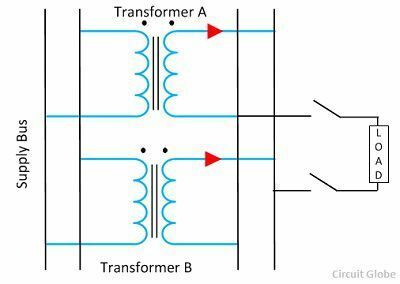 The ratio of their winding resistances to reactances should be equal for both the transformers. This condition ensures that both transformers operate at the same power factor, thus sharing their active power and reactive volt-amperes according to their ratings. what will happen if there’s small difference in reactance or turn ratio? Because in practical it couldn’t be 100% same. Turns ratio of all transformer must be same for parallel operation otherwise a circulating currents will flow.